What is The Fish Grip? The Fish Grip is the perfect fish landing tool for fishermen of all kinds. The unique jaw design holds the lip of the fish without harming the fish and the wrist lanyard always keeps it close at hand. Another great feature of The Fish Grip is that it floats when dropped into the water! A tool for handling fish may seem a little over the top at first glance. 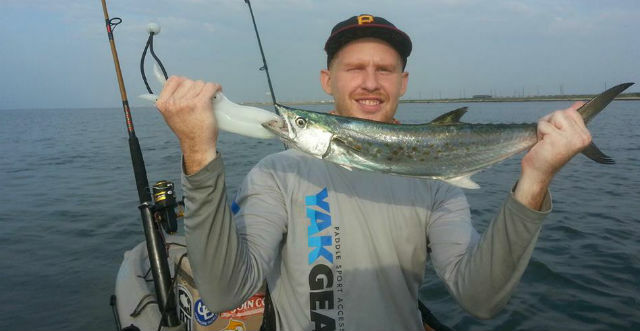 After all, innovation in the kayak accessory industry is catering to – maybe even promoting – our odd attraction to specialty kayak fishing gear. Companies are developing ways to mount, store, rig, and secure anything and everything to a kayak. Do you really need it? Regardless of the size or species fish you are landing, your control and handling ability is important for the survival of the fish. Why? Because time hooked up, battling for survival, and out of water all needs to be minimized for the fish’s best chance of survival! 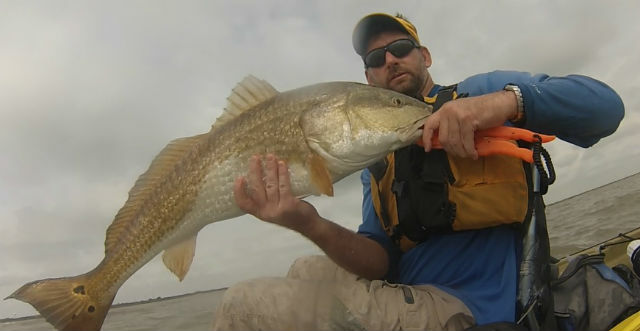 Squeemish newbie or experienced veteran, a strong head shake is enough to make any kayak angler hesitate a little, lose a little balance, involuntarily loosen or tighten your grip on the fish, and waste time. With the Fish Grip, the over center locking mechanism allows you to get a grip on the fish’s lip and not lose control or handling ability. While your finger muscles may loosen on a head shake, the durable locked plastic will maintain a good grip. This added control and handling ability allows you to keep the fish in the water while taking the hook out or minimize the time out of water while handling the fish. Note – While handling fish out of water, be sure to wet your hands before touching the fish to protect their protectant slime coat. Also, try not to touch their delicate gills. A lot can be messed up with little force in the fish’s gills. In a sport where storage space is limited, nets get in the way! The concept is nice – store your net like an anchor or extra fishing rod in your rod holders. Great, but…where does my anchor and extra fishing rod go now? There is only so much space! Not to mention, nets have a tendency to act as two things while on the water: 1) kayak sails when the headwind is strong or 2) hook magnets. Keep your hooks baited and in the water where they can catch fish instead of tangled in your net. It didn’t happen if there’s no picture! We get it. This newfound combatant rule for the ol’ fisherman’s tale has some merit. With point and shoot camera innovation and popularity through the roof, social media as a valued means of sharing fish pictures and videos, and – insert shameless Railblaza plug – camera mounting gear options rivaling that of a low budget Hollywood Studio, photo ops have become a seemingly necessary aspect of catching fish! The Fish Grip allows the photo op to be quick and as harmless as possible for the fish. Remember, the time you waste making sure your sponsors stickers are showing, your hair is brushed, and the sun is properly set for a good Instagram glare, the fish is struggling to maintain its health. Have your camera and camera mounts ready while also letting The Fish Grip improve your photo op handling efficiency. If nothing else, it gives you one more company to tag when you post it to social media in the hopes of them sharing it and you maintaining your image as a world class kayak angler! Note – When you’re done, skip the tossing and gently place the fish in the water while cradling it until it regains its settings and musters up the strength to swim away. You’ve got no photo without that fish, at least have the decency to make sure he leaves the photo studio healthy and makes it back home.